Recording sound quality is upmost important for music. I used to consider the plugged in sound feed, direct from a pickup, the highest quality sound you could get from a guitar. But many years ago I bought a Zoom H1 stereo condenser microphone/recorder, and it blew my mind. The sound is *so* much better! It makes sense, you are capturing all the other subtle nuances that a pickup misses. I had already gone to dual pickups in the guitar, one that captures the soundboard as well under the saddle, which is great, but a quality microphone; that is hearing like your ears do; so much better! The Zoom H1 has done me well for a long time, and I have an application coming up where I want to use two microphones, to capture an orchestra sound from both sides of the stage. I was going to buy another Zoom H1 but I noticed the new Zoom H1n is available, the upgraded version. I has a lot more "stuff" like dubbing and playback at different speeds and other things I don't need, about the only feature I thought might be useful for my purpose was the limiter. However, it's only $20 more than the old model, and perhaps the microphones themselves are improved or something, so I bought one. As a test I put them both in front of me playing guitar, one to the left, one to the right, and recorded both in the same mode being 48kHz 24bit WAV. I attempted to match the levels at recording time but I didn't get it very close so I adjusted amplitudes in post, I also applied the same graphic EQ to both. I always apply some EQ to drop down the mids and boost the lows and highs a bit. Makes the sound more punchy and less AM radio. Or maybe that is just my tinnitus speaking. I do all this listening through Sennheiser HD280 Pro monitor headphones with a quite flat frequency response, so it should be pretty accurate. What did I find, what was the difference? 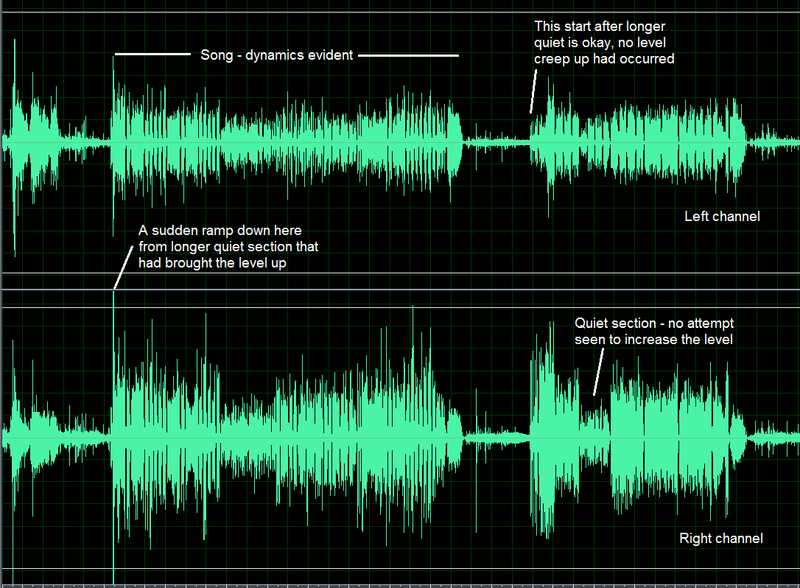 The visual look of the WAV files showed some differences, like the H1n was maybe slightly more sensitive? But listening, no, they sound the same, other than a difference due to the location of the mics; you can tell they weren't in the same place. For interest, that was a sound grab from an arrangement that popped into my head last week, Bob Dylan "It's All Over Now Baby Blue", although I gone with more of the Graham Bonnet 1977 more rock less folk as that's the version I remember, more my era. I will probably talk about that more another time. I've been continuing to play as a duet with an amazing violinist, who continues to amaze me. We both have kids in a private orchestra, we both pick up our kids, when we realised we could play as a duet we headed into a vacant music room 45 minutes before end of orchestra practise. He has a strong love for latin jazz, ragtime, blues, oldies - and he is far more organised than me so he brings books and I try to keep up with suitable fingerpicking chord progressions. He's a properly trained musician so it's been really great to duet with him. I feel I let the side down but he's happy just to be playing. It's the same story - he was heavily into playing in orchestras/ensembles but then with life and kids it falls by the wayside. Eventually as that chapter of life gets easier (in some ways, not others!) you get back into it. I never let it go, hung onto playing guitar at least a few hours a week, through all chapters...but I get it that people will let it go. So long as you go back I reckon! I will record one of our jams sometime and post it here for interest sake. I played at one of my mate Shaun's open mics. I have recently been adding to my Dark Side of the Moon some of the spoken parts, "I've been mad for years, absolutely years..." "And I am not frightened of dying, anytime will do I don't mind..." and the like. It is challenging to speak while playing reasonably complex fingerstyle, but more daunting is speaking it into a microphone. But I decided I had to do it, so I did. Face fears and all that. My play through of the album was not amazing by my own standard, and I think the spoken words didn't make sense to the audience. I will re-record it and put in the spoken parts for youtube, another chapter in the project, but not sure I will do it again at a gig. I also knew it would be a mistake playing the album as one pass - we were in the beer garden, the guitar was initially cold, and after around 5 minutes in it would be warmed up and would go out of tune. And because it is a noisy environment when I switched to drop D halfway through I wasn't really sure I was properly in tune, so I was stressing the whole time about not being in tune. Lesson - always start with a few short songs so I can retune in between as the guitar comes up to temperature, and it will also relax me for playing such a challenging and lengthy piece. After Dark Side, I played two rockin' numbers and I was happy enough with the play through on both. I hung around to watch another fingersyle player and chatted to him afterwards, he thought my Dark Side arrangement was amazing; I thought his ability to sing while playing fingerstyle was amazing. He threw in a complicated solo fingerstyle rendition of Billie Jean which he executed well; you can tell the guitarists who have seen some solo fingerstyle, loved it, and determinedly learnt one. That was the start of my solo fingerstyle. I think I had to determinedly learn the first 10 arrangements from tab, then arrange 20 of my own, and then keep doing that for another 10 years before it started to become natural. But I could see based on his solo fingerstyle piece why the first fingerpicked songs with singing he made look effortless. If you bite off a huge piece and persist for hundreds of hours the rest of your guitar playing is brought up as well. I reckon I could fingerpick any pattern you like in chords all day; and it's because the attention I paid to solo fingerstyle that makes that happen.